These assets are not mine,credit goes to all the assets from the LPC contest. LPC tileset atlas in 1024x 1024 so you can use it as a a hardware accelerated texture on even older hardware. The terrain is base with LPC entries that are "terrain",farming and vegetation. A note on Johann C - Shoot'em up graphic kit entry, his tiles are not very detailed but there pretty good and with a bit more editing and detail would work wonderfully with the base. Also if by some chance I miss some authors in the licence please tell me. The zip contains a nifty attribution file so you can drop it and forget. Very useful! Thanks for going through the work to make this! Great job. I am happy to see that my assets (the shoot'em up graphic kit) are not so different than the others even if they are built in a SVG format. Of course, they should have to be more detailed. Just a point, could it be possible to change my full name in your comment with my local login (Johann C)? Maybe you should provides the texture coordinates of each tile, if you have them? That would be useless, they already have a sequence since they are packed 32x32 so the next tile is 32*(x+1). Tiled or other map editors auto create there own ids for tiles and adding the sequencing in your personal map editor is trivial. If you wanted this for procedural generation you would need a lot more information than just texture coordinates from type to corners,walls and so on which is a hassle and only benifits those people. Thanks for these, they'll reduce work load for anybody who needs them laid out like this. where index is your row or column. Looking at the index as a linear number instead of row/col just requires a little extra math to get the u/v coords but otherwise uses the same values. In very time-critical applications such as with limited math processing power (unaware of any modern platforms where this problem exists) the texture coords could be generated at start-up and stored in a lookup table... but like I said, that's highly unnecessary with today's hardware (or even hardware from 5 or so years ago). Could you tell me where the tree in the upper right came from? It's not part of the base set, and I couldn't find the LPC entry that had it. I want to make sure to have that information because I had to modify it in order to overlap them in tiled without a million layers. Since I intend to do some game development with the LPC artwork, I want to make sure I have the attribution for that one down. Thanks! It makes me feel better having that asset's attribution. I am currently using it for PyORPG (http://www.powrtoch.org/pyorpg/). Cheers for the tileset! I dont need this but I can see how it could be helpful so thanks for taking the time to do it. Great job, this is an awesome collection but there's an error in the base set and by extension this set as well. Right now they are in the middle of the tile and you can see how it looks below. These are the only errors I noticed so far, I can fix them but I'd rather see this atlas updated for everyone than upload another version. So... I noticed this is released under GPL... so if I use this in a commercial game does that mean the game would have to be released under GPL as well? Only if it's software or packed into an executable. It should be fine if you call the image from a folder inside the directory rather than storing the image inside the compiled executable. If you put it inside, you have to release the game as open source. @vatigo - I experienced the same problem and ended up fixing it with this. 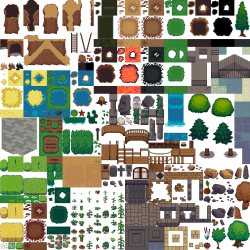 I believe that if you were mapping in 16x16 with 32x32 tiles you'd find the tileset works. Dragon Quest mapped in a hybrid 16x and 32x style but had 32x sprites so when they moved it was a hybrid of pixel movement and tile movement. ah I believe you are right from a quick test, thank you. I still prefer to use 32x32 tiles, for memory and performance concerns, and the above fix works fine for that. But I'm glad to finally find out how they're supposed to be used and why just these few things wouldn't align properly for me. I think it'd also work both ways with the above changes. Hi everyone can someone check if I got it right. 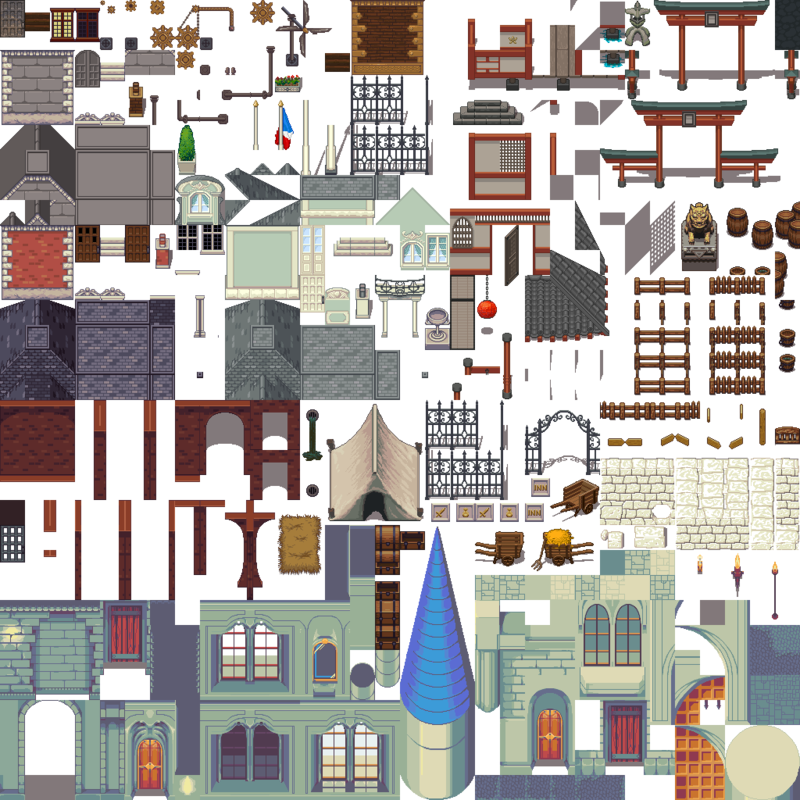 I can use this atlas for my commercial game as long as I give credit's to everyone in attribution file? PS:Game is not open source. @rstanic12 This is licensed CC-BY-SA, meaning in order to use this, you have to release ALL your game's art under CC-BY-SA or a compatible license. Generally this shouldn't affect your code license (ie. non-open source is okay), but I am not a lawyer, so you'll want to get professional legal advice as well. Ah well I dont want to get sued so I'm going to start drawing my own art. Quick question: why and how is this released under two different licenses? Which one are we supposed to follow if we wanna use this in a commercial game? When there's more than one license listed, you can pick your favorite one. Generally, you'll want the CC-BY-SA license over GPL since it's more compatible with other art. It's nice when artists dual license like this though, because it potentially increases compatibility with other assets. Hello. Any chance of a CC-BY or OGA-BY license option being added to this one? I'm wary of using this art for fear of being obligated to release my whole game and/or its code for free. 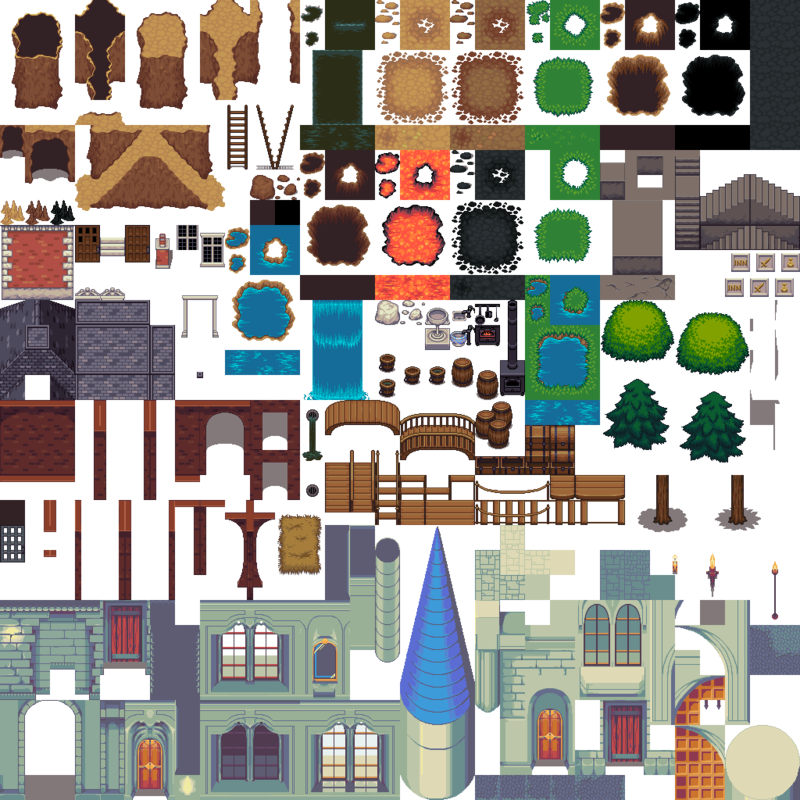 hello, i really like the tileset! i would like to use this on a game i'm making for the construct 3 gamejam. is there anything i need to know before using it? the game will be open source. Thanks! If I Were to use these in a game say on the google play store,Would it have to be open source. Or will just providing credit be enough. Any help on this would be great as i dont completely understand the licensce tems.